UTI stands for urinary tract infection. Nearly 1/3 of all the women in America will have a UTI before the age of 24. How does a UTI happen? A UTI typically occurs when bacteria enters the urinary tract. 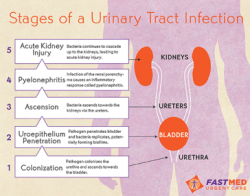 The urinary tract includes the urethra, bladder, ureters, and kidneys. The kidneys filter waste from the body and send it to the bladder through the ureters. The urethra is the tube that connects the bladder to the outside of the body, allowing disposal of urine. The bacteria normally enters at the urethra and continues up through the tract, causing an infection. UTI symptoms include pain or burning during urination, an urgent need to urinate but little or no urine produced, and cloudy or foul smelling urine. Depending on where the UTI is located along the urinary tract, you may also experience fever and a tenderness in the belly. How serious is a UTI? Normally, a UTI is easily addressed by antibiotics. Please find the FastMed medical clinic nearest you and see a doctor as soon as the symptoms begin. If left untreated, a UTI can become a very serious health issue. If the UTI engages the upper urinary tract toward the kidneys, it is no longer a simple bladder infection but is called pyelonephritis. This UTI can cause high fever, vomiting, and significant pain around your kidneys. The response to a UTI that reaches the kidneys is much more aggressive due to potential complications. Can I get tested for a UTI at FastMed? Yes. We have labs at each of our FastMed walk-in clinics, so test results are almost immediate. Once the UTI is confirmed, we can start you on the appropriate course of antibiotics. Staff can even provide you with onsite medications, saving you valuable time and money by leaving the clinic with your medications in hand. Don’t worry about an appointment. We’re open 365 days of the year and walk-ins are welcome.